On a large, peaceful tidal bay in Millbridge, with long views to spruce-covered islands, our cottage is a cozy getaway. With lots of windows facing the water, this is a bright and cheerful little house. A deck off the house faces the water. This cottage has been completely renovated and is a lovely, light-filled space. South-facing windows offer a breathtaking view down the tidal bay. The kitchen is well-stocked with cook and bakeware, including big pots and everything needed to cook a lobster dinner. Our cottage is just a few yards from the shore, and open to the ocean breezes. A line of rose bushes along the bank provide fragrance and blooms during summer months. There are stairs to the shore, but children under 10 need supervision. Nights can be cool even in a Maine summer, but there are plenty of cozy blankets and quilts, and a small propane stove should you need heat. The cottage is quiet, private, and peaceful, and a wonderful place to unwind and relax. This 2-bedroom cozy space is ideal for a couple, but could also accommodate other guests or children with the twin bed in the second bedroom and the pull-out couch in the main room. The first bedroom has a queen bed. This cottage is located in a quiet neighborhood of other cottages and farms on Ray's Point, a finger of land extending into Harrington Bay. It's a beautiful part of Downeast Maine, with many points and islands to explore. You can see eagles and shore birds from the cottage and the deck, and kayak in the bay and beyond. (This is a tidal bay, so launching from the cottage is limited to hours around high tide; there is a deep water launch site in Milbridge). Ray's Point Road is a nice area for walking and biking and there are many hiking trails just a short drive away. The village of Milbridge (shopping, post office, restaurants, library, etc.) is less than five miles away. For day trips, Acadia National Park (Schoodic Peninsula area) is a half hour away, Bar Harbor (where the main section of Acadia National Park is located) and Ellsworth are a 45-60 minutes drive. Petit Manaan National Wildlife Sanctuary (great birding and hiking) is less than a half hour drive. Campobello Island, New Brunswick (FDR's summer home) is within an hour and a half, as is Quoddy Head, easternmost lighthouse in the US. Lobsters and clams available in Milbridge (lobster and clam pots provided with cottage). This is one of the largest wild blueberry producing areas in the world, so there are plenty of berries available nearby during the season (late July through August). Berry picking is permitted at Petit Manaan National Wildlife Refuge, in season. Bangor International Airport is about 1 hour 20 minutes, Portland is approximately 3 hours, and Boston is a little over a 5 hour drive. This cottage is for weekly rentals, Saturday to Saturday. Checkin is at 3pm and checkout is at 11am the following Saturday. In order to make this a pleasant rental for all, smoking is not allowed inside the cottage. Pets are considered on an individual basis. The house has no wifi or cable but we have supplied a hefty selection of books and DVDs for any rainy days. In our rural area of Maine, be aware that cell phone reception can sometimes be spotty. AT&T, Verizon, and US Cellular all have relatively good coverage in our area, but we cannot guarantee good reception. I (Bethany) work at a non-profit in northeastern, coastal Maine and love all things outdoor and food-related! Favorite activities include hiking, island camping, vegetarian cooking, baking pies, xc skiing and snowshoeing, gardening, and satisfying the travel bug whenever I can. My husband, Clay, is a carpenter and builder, and we renovated this sweet place together. We're so excited to share it with visitors! Downeast Maine is an incredible place. Maine's rugged coast provides endless possibilities for adventuring. (In our welcome packet, we've included many local places to explore that you won't necessarily find in a guidebook.) My husband grew up in Maine not far from Milbridge, and we're both attached to the area and community. Our cottage sits just 20 feet from the bank that is filled with rosebushes in the summer. Being on a tidal waterfront means that at low tide clammers are out digging in the flats, and just 6 hours later at high tide, you might see a seal out in front of the house. Our south-facing cottage gets lots of sunlight all day, and all the windows really brighten up the main room. Other days, you can watch the fog rolling in over the islands in Narraguagus and Back Bay. The scene is always changing, but always beautiful. A beautiful south-facing view down a tidal bay full of islands and sea birds. Towels are provided for the bathroom in the house. Please bring additional towels for swimming or taking out and about. The kitchen is very well stocked with cooking pots, pans, small appliances, utensils, and bakeware. This little cottage was a perfect place for a week of hiking, kayaking and just relaxing with a glass of wine and enjoying the sunsets. Very well equipped kitchen, it is simple but has everything you need. My husband and I used our phones (AT&T has good service here) for hotspot internet, which worked very well. (Who needs TV anyway?). Milbridge is charming and the seafood is great (we were at Chipman’s Wharf to buy steamers every day). We saw bald eagles and seals while hiking and kayaking in Macchias Bay...we plan to come back for more. It was a perfect get-away. Thank you Bethany and Clay! Our family loved our stay at this cottage. Bethany and Clay went out of their way to make us welcome and to stay in touch. The cottage is cozy and spotless! 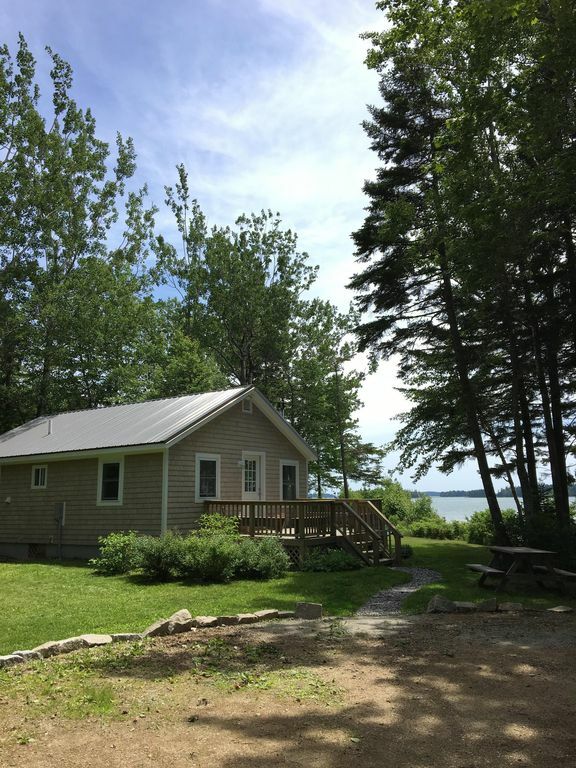 Perfect location as a starting point for Downeast adventures or relaxing by the bay. I would recommend this cabin for a romantic getaway or for some family time. This was our fourth rental in the area and by far our favorite. It is obvious that these owners are detail oriented and thought about everything when they updated it. Nestled in the woods, large array of windows overlooks the back bay. Lovely view of the bay. Saw several different kinds of shore birds. A real treat. There is also a guest book in house with all helpful information, what to do, where to eat, what to see... a perfect vacation for us! Thanks so much Agnes! We really loved having you and were so glad your family had some quality time away. We hope you'll be able to come again soon for another visit! Downeast Seaside Cottage was a wonderful vacation! The property was very clean and well-maintained. Bethany & Clay provided all the necessary provisions for our week vacation to Maine. The location of the cottage was between Acadia National Park (Mount Desert Island) and Campobello, (Roosevelt"s Vacation Home) New Brunswick, Canada. After a busy sightseeing day it was nice to relax by the fire pit and watch the sun set over the bay. We had a wonderful time at the cottage. We hope to be back again! We are so glad you were able to enjoy the Downeast region! We hope you'll be able to visit again soon! This waterfront cottage was perfect! Situated about an hour from Ellsworth and Lubrec made this getaway perfect for site seeing. We enjoyed looking out over the water through al the windows and out near the fire pit. We will be back again! Thanks for your kind words, and we hope to have you back again soon!